Quivira Golf Club, the epic Jack Nicklaus Signature-designed course etched across a dazzling site at the tip of the Baja Peninsula, has received a 2019 Golf Digest Editors’ Choice Award for ‘Best Resorts – Mexico and Central America’. This is the fourth consecutive year the club has been singled out for recognition by the sport’s most respected and widely-read publication. Golf Digest’s description of Quivira Golf Club in its online edition sums up the dramatic layout’s appeal. “At the tip of Baja (California) Sur is the newest of more than a dozen Jack Nicklaus layouts in Mexico, and perhaps his most compelling, with holes along and atop granite cliffs and sand dunes overlooking the Pacific,” the report stated. “Several lodging facilities nearby offer access,” including Pueblo Bonito Pacifica Golf & Spa Resort, a deluxe all-inclusive, adults-only beachfront property favored by golfers. Opened in 2014, the Jack Nicklaus Signature course at Quivira is recognized as one of the most impressive resort venues in the hemisphere. Created as an exclusive amenity for guests of Pueblo Bonito Resorts and Quivira Los Cabos residents, this daring risk-reward design, marked by sheer granite cliffs, massive windswept dunes and rolling desert foothills, features breathtaking views and dizzying drops from tee to fairway. In a sun-splashed destination celebrated for its unique ocean-desert-mountain ecosystem, Quivira offers more oceanfront exposure than any other course in Los Cabos. An unforgettable test from any set of tees, this 7,085-yard, par-72 tour de force may be the most daring and eclectic course Nicklaus has ever built. Selected award-winners will appear in Golf Digest’s June print issue; all award- winners will be featured on GolfDigest.com. Potential expanded coverage will also be broadcast on Golf Digest Stix and on the publication’s social media platforms. For additional information or tee times, access www.quiviraloscabos.com. Quivira (pronounced key-vee-ra), Mexico’s premier luxury residential resort community, is situated at Land’s End on the Baja Peninsula, with more than three miles of pristine golden beaches, picturesque desert cliffs and panoramic ocean views. This exclusive 1,850-acre master-planned community, founded by renowned resort developer Ernesto Coppel, is a paradise of elegance, serenity and service. 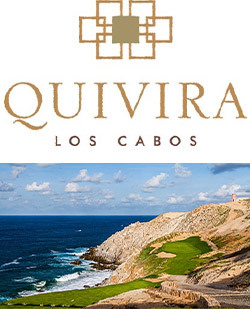 Within Quivira, resort guests at Pueblo Bonito Pacifica, The Towers at Pacifica, Pueblo Bonito Sunset Beach, or Montecristo Estates Luxury Villas, and residents of the Copala and Coronado communities have access to Quivira Club. Occupying a spectacular natural landscape, Quivira Golf Club, a Jack Nicklaus Signature golf course, is complemented by an exclusive oceanfront clubhouse. Quivira Los Cabos is the ultimate destination for residents and guests to live, love and celebrate life. Pueblo Bonito Golf and Spa Resorts has eight award-winning resorts in two destinations, Cabo San Lucas and Mazatlán, all offering luxury all-inclusive options. Each of the properties has its own personality, design and ambiance, yet all share the same high level of impeccable quality and distinguished atmosphere. For more information visit ww.pueblobonito.com and find us facebook.com/PuebloBonitoResort and follow us on Twitter @PuebloBonito.